Having an amazing outstanding decoration for Christmas doesn’t always have to be high-priced. 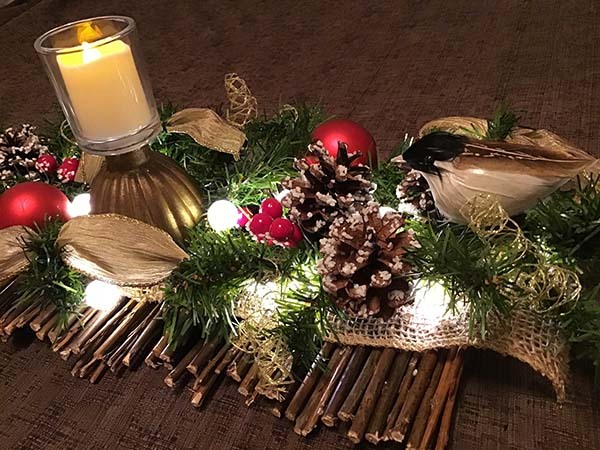 You just need some artistry, a good company, and a few supplies and you will be well on your way of making some beautiful DIY Christmas centerpiece ideas. 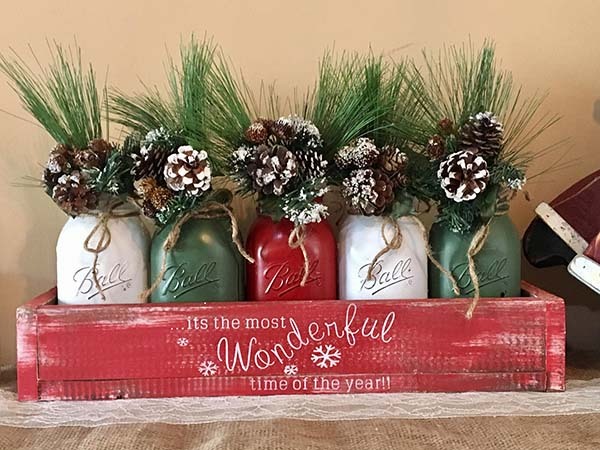 Trust me, with a bunch of tea candles, faux evergreens, and cranberries from the dollar shop, Mason jars and some pinecones from the nearest forest, you can create eye-catching cheap Christmas centerpieces for no time. To help you get started, I’ve prepared 21 ideas for Christmas centerpieces that will blow everyone’s mind. 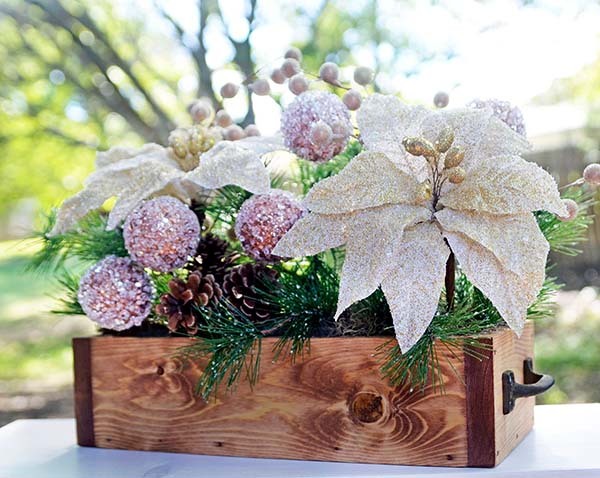 This frosted floral arrangement, in a DIY wooden pine box, is a perfect addition for a classy elegant holiday decor. This type of frosted Christmas centerpieces is usually reflecting the lights from the festive tree and spreading the magic of Christmas through the entire living room space. This beautiful buffalo plaid floral arrangement is surely catching everyone’s eyes. 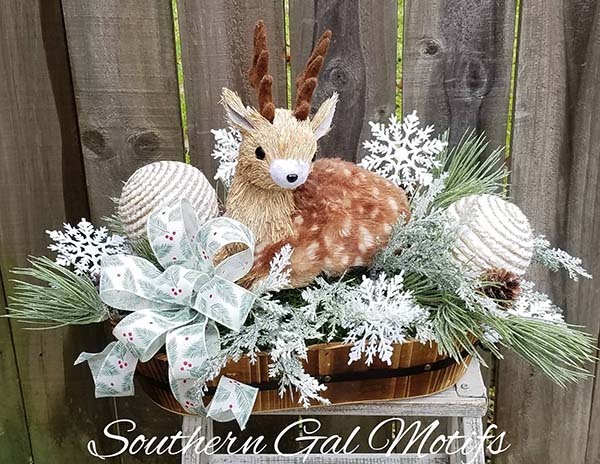 If you are looking for some homemade Christmas centerpieces that look great indoor as well as displayed in the front yard, this one might be exactly what you’re looking for. Even though many people associate the red, green and golden as the colors of the holiday, there are some elegant Christmas centerpieces (such as this one above) that make a strong statement without necessarily being too colorful and showy. 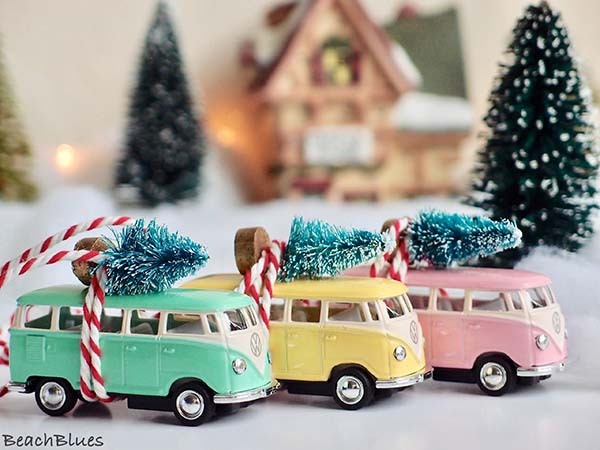 This trip of VW bus tree ornaments is certainly one of my favorite Christmas tree centerpieces! They kind of bring a strong Christmas vibe as well as the ocean breeze. Imagine a little tiny Santa figure driving one of them…cute, right? When you’re planning the holiday decor this year, don’t forget to pick up one of the Christmas table centerpieces ideas internet is full of. 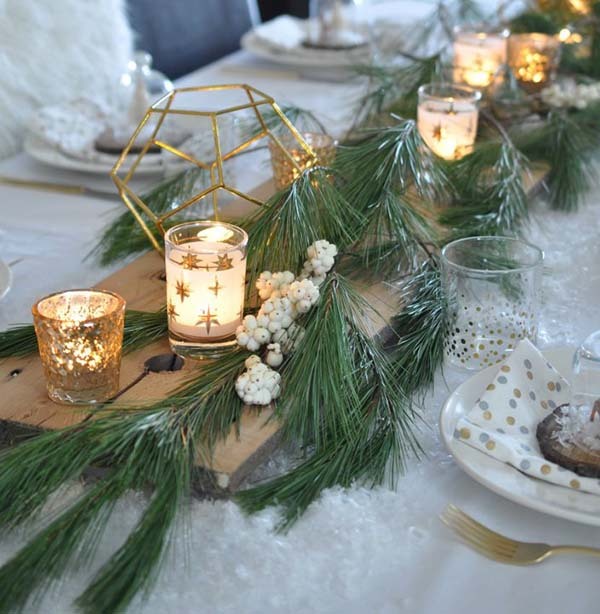 You can create something amazing with some evergreens, candles, and a bunch of other shimmering elements. This one of the pictures above, for instance, features wood, birch, pine, lights, chandeliers, and a couple of Christmas tree balls. 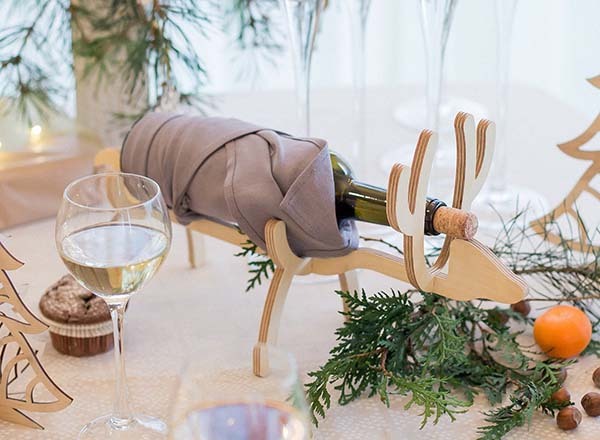 This DIY wine bottle holder is not just one of the most original Christmas dinner centerpieces, but it is also very practical. Do you know what is the best thing about having one of those centerpieces for Christmas tables made of artificial flowers and greenery? Answer: they look so real and will last forever. Moreover, they give a nice additional texture to the table. I instantly fell in love with this unpretentious rustic box packed with cheerful Mason Jars. The jars are distressed and covered with chalk paint. 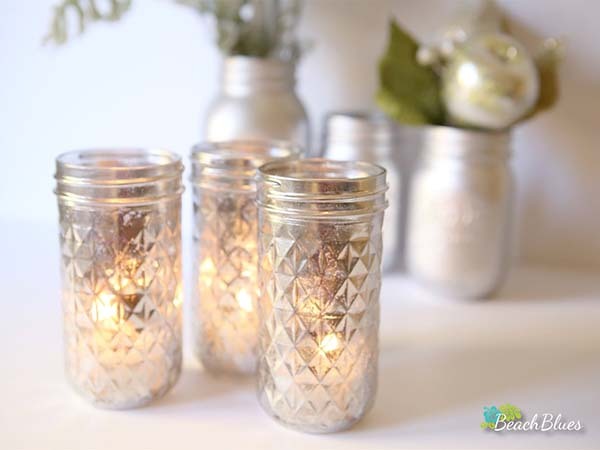 Ring in this holiday season with one of those cute Mason jar Christmas centerpieces! This DIY golden geometric Christmas centerpiece can make your holiday party unforgettable as well as your wedding, birthday, or bridal shower party. It’s basically a light-hearted yet contemporary geometric home decoration for (almost) every occasion. 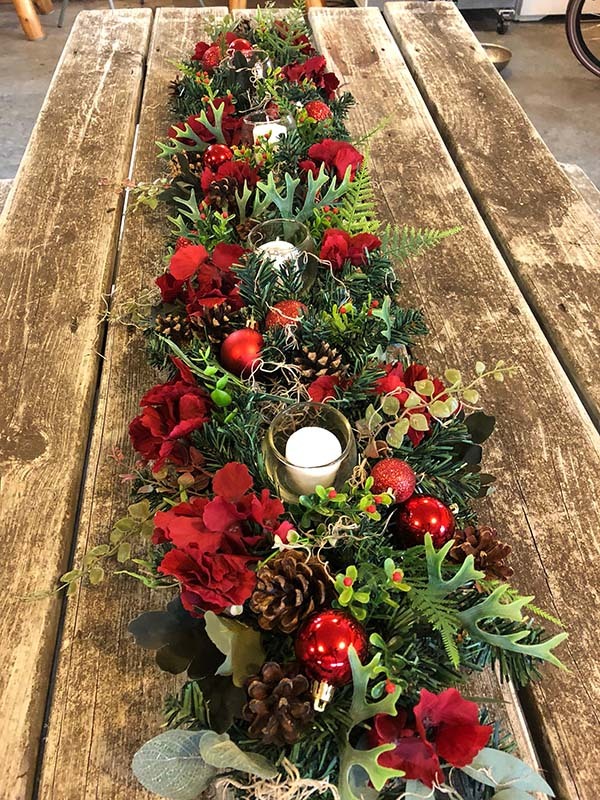 All you need to re-create this large garland centerpiece is a bunch of pinecones, Christmas balls, hydrangeas, calla lilies, poinsettias, different (faux) greenery, and 4 glass tealight holders. You can buy mainly everything from the dollar shop or from the nearest forest, that’s why I can include this project to my list of cheap Christmas centerpieces. Here is something cute that is suitable for smaller dinner tables. 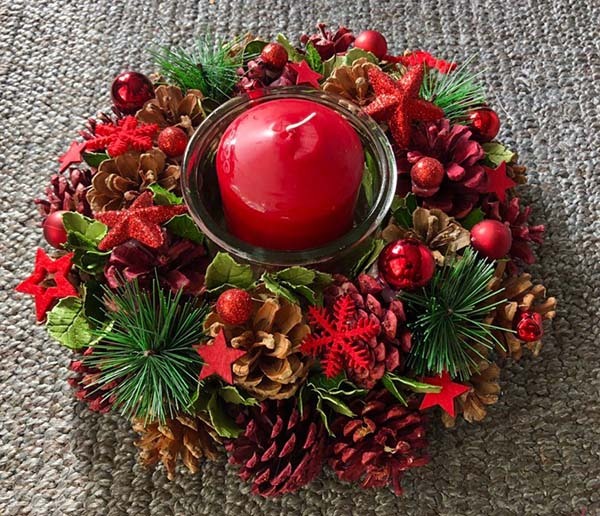 Even though it is made of pinecones, pine, with foliage of Christmas balls, and old-school decorative elements in red, you can customize this centerpiece by switching to a blue or gold candle, for instance. Be creative while you’re making the Christmas table centerpieces at home. I hope you’ll like this holiday centerpiece as well! I found this project while I was searching for some Christmas centerpieces ideas. The first thing I’ve noticed in this picture was the difference in the height of the elements. That’s what makes it so cheery and eye-catching, I think. 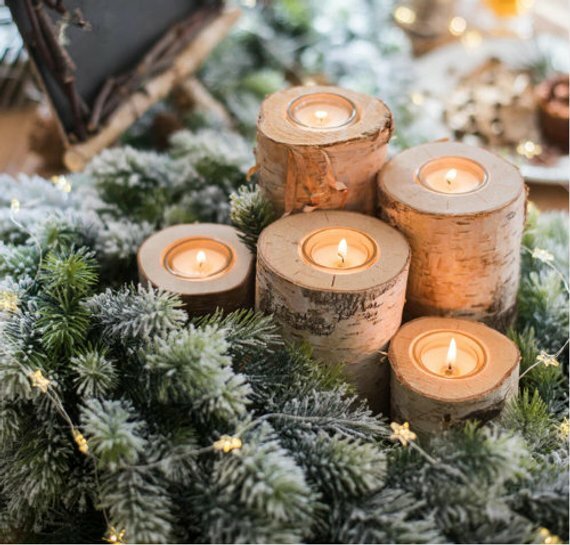 This handmade candleholder set made of white birch is one of the most original rustic Christmas centerpieces with a candle I’ve ever seen. Each one of the candleholders looks so organic, unsophisticated and yet elegant. The evergreens displayed around are the best final touch to this centerpiece. 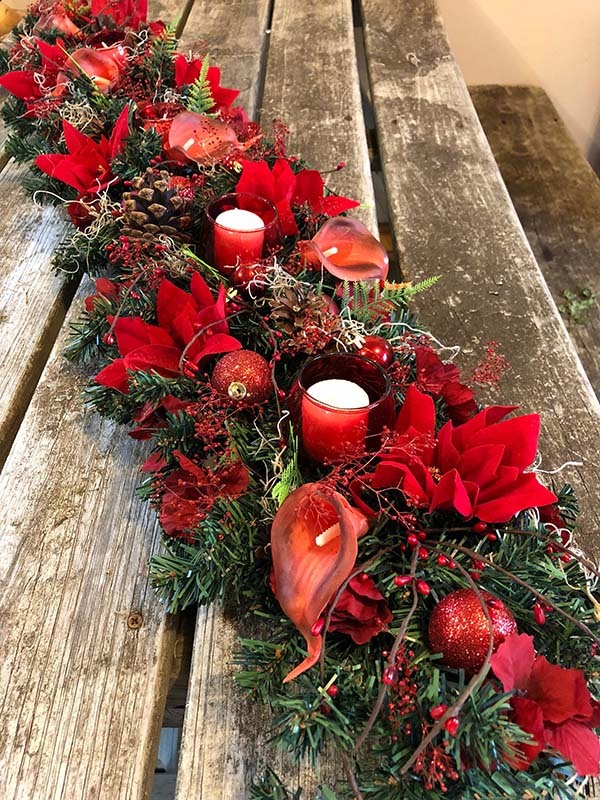 If you’re a fan of the traditional red-and-green Christmas decoration, this garland centerpiece might be the right fit for your festive dining table. 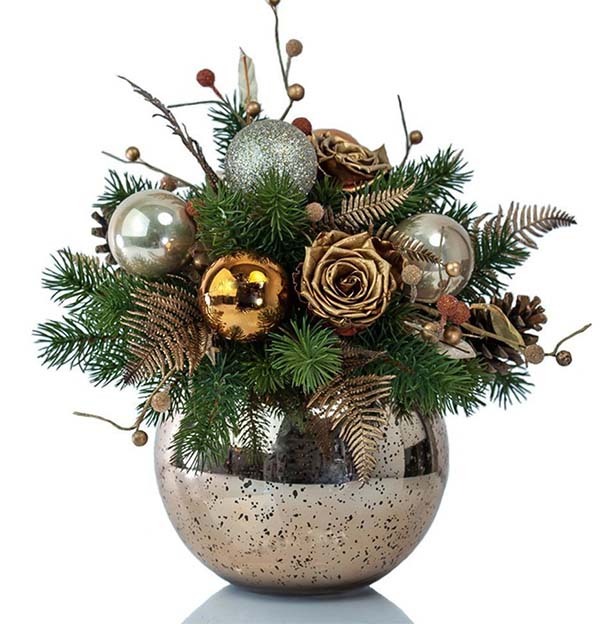 I like the texture and the glamour these faux flowers and Christmas balls add to the table. 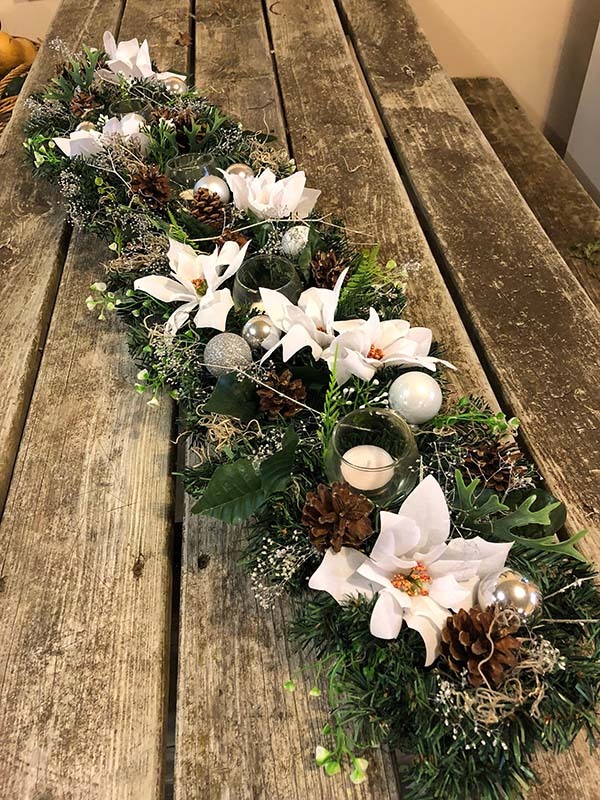 Do you like the Christmas flower centerpieces in snowy white? They are so delicate and elegant. This one in the picture above, for instance, is filled with holiday floral including a velvety soft poinsettia, adorable little owl, and other frosted elements. The buffalo check is one of the hottest trends in the Christmas decoration! 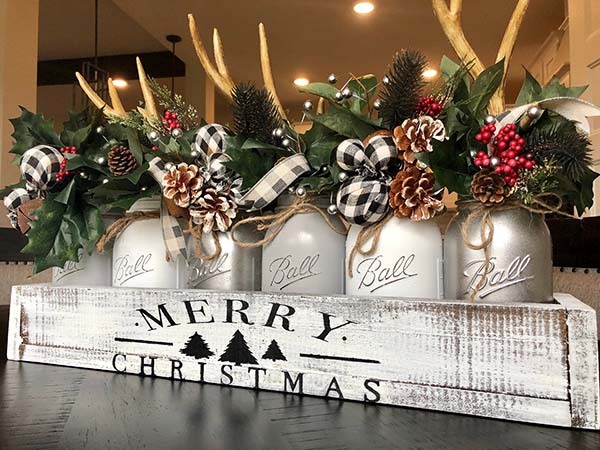 This set of hand-painted Mason jars, filled with classic buffalo check, antlers, faux cranberries, bells, and ribbons, gives your decor a very rustic and yet stylish feel. 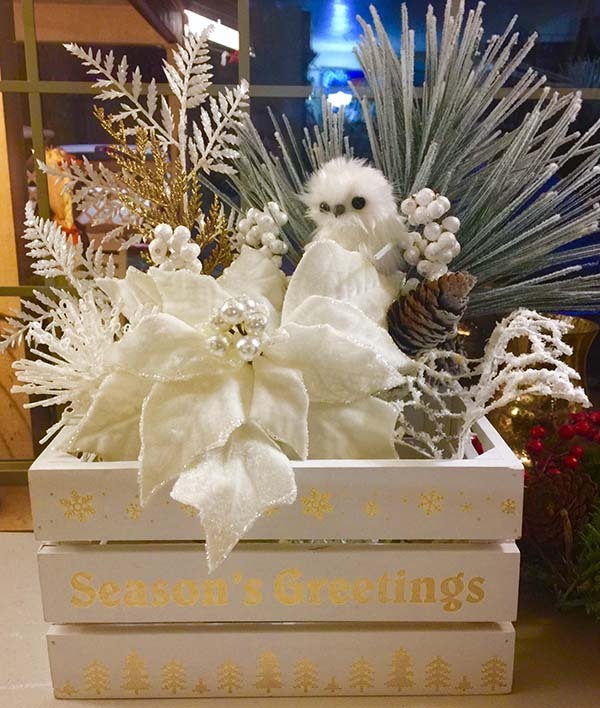 Some Christmas centerpieces are just full of traditional festive vibes… such as this little cheery wooden box. 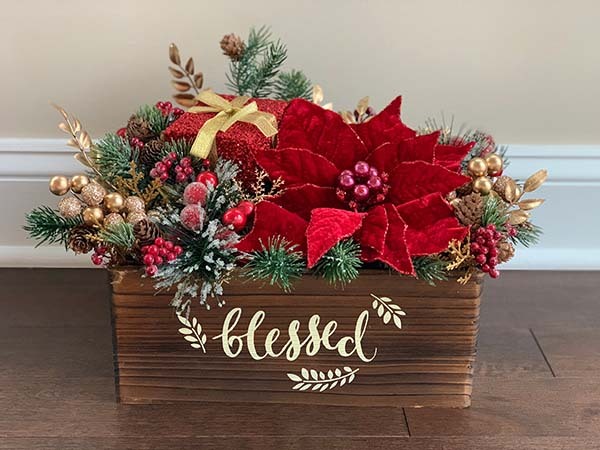 The written sign “BLESSED” will be spreading holiday joy all over your house! If you decide to re-create this project, think about personalizing it in order to incorporate your own taste and style. 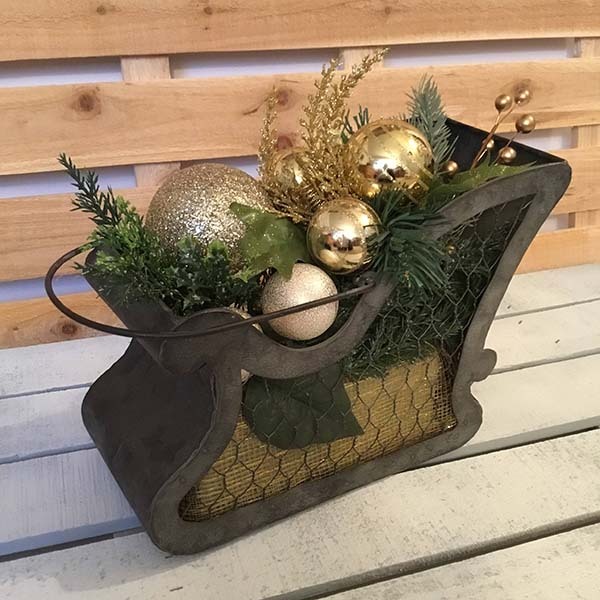 This exclusive galvanized tin sleigh is embellished with sparkly gold ornaments to brighten your holiday home! Also, great idea for a Christmas gift! 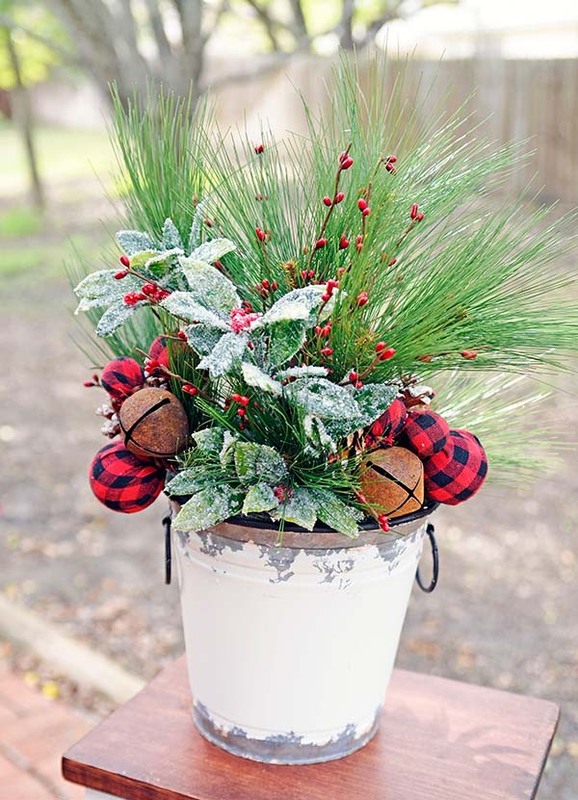 This is one of the most original DIY Christmas centerpieces. Believe it or not, it is made of a small fishbowl painted in gold. Every element is just right on spot – the real-looking faux pine, the preserved gold roses, and leaves, the beautiful pearl baubles, pine cones complete this stunning holiday arrangement. How cute is this Christmas centerpiece? Surely, it is a charming addition to every holiday decor and will bring glitz if displayed on an entry hall table, dining room, kitchen island, bathroom counter. 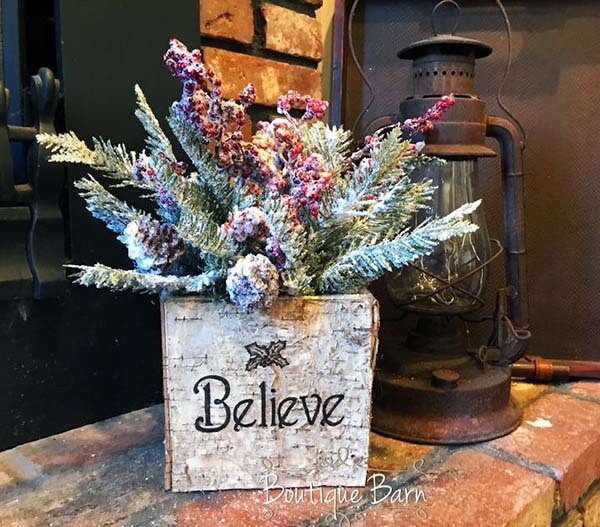 I decided to finish my collection of Christmas centerpieces with this rectangular rustic birch planter box is ideal for storing some frosted Christmas flowers, evergreens or candies! The sign “BELIEVE” is burned into the side with some holly leaves to embellish it. 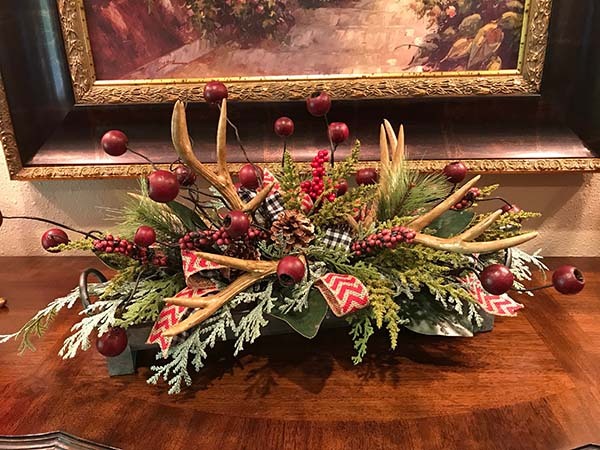 Even though many people are focusing on the decoration of the Christmas tree and the space above the mantel, the festive centerpieces also deserve your attention. Hope you liked some of the ideas I just shared with you! So, let me know, what are your favorite Christmas centerpieces from my collection? Share your thoughts in the comments below!